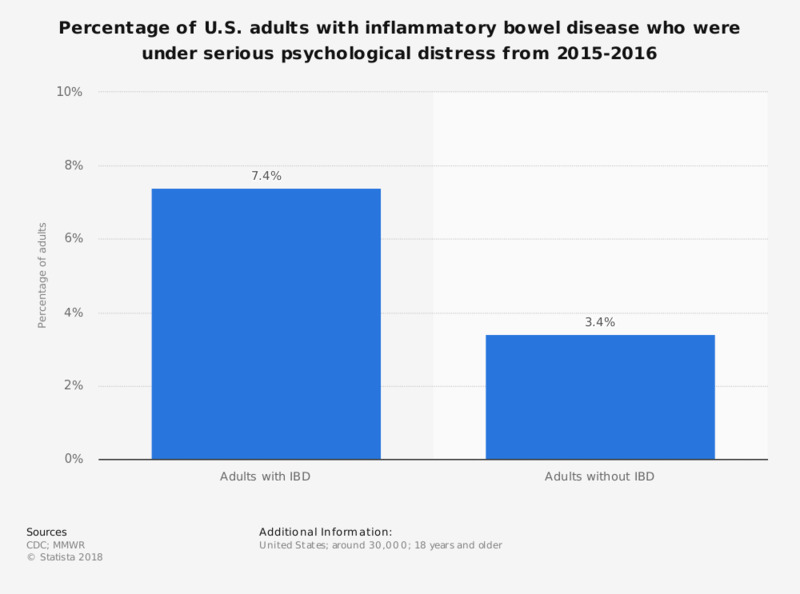 This statistic shows the percentage of U.S. adults aged 18 years or older that had inflammatory bowel disease and some kind of serious psychological distress from 2015 to 2016. According to the data, among those with IBD, 7.4 percent had serious psychological distress. "Serious psychological distress is based on responses to six questions that ask how often a respondent experienced certain symptoms (feeling so sad nothing could cheer you up; nervous; restless or fidgety; hopeless; that everything was an effort; worthless) of psychological distress during the past 30 days. The response codes (0–4) of the six items for each person are summed to yield a scale with a 0–24 range. A value of ≥13 for this scale is used here to define serious psychological distress." Inflammatory bowel disease (IBD) in the U.S.
Everything On "Inflammatory bowel disease (IBD) in the U.S. " in One Document: Edited and Divided into Handy Chapters. Including Detailed References. Statistics on "Inflammatory bowel disease (IBD) in the U.S. "
Arthritis and rheumatic diseases in the U.S.